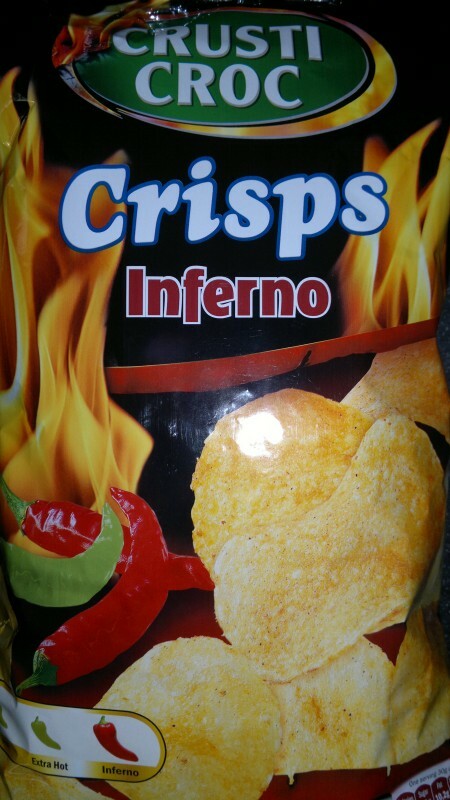 Following last November's group test of hot chilli crisps here at insertcrisps.com, it is incumbent upon me to alert you to the availability of a new contender: Crusty Croc Inferno flavour (available from Lidl). Homer: Five-alarm chili, eh? (Tries some) One... two... Hey, what's the big idea? Ned: Oh, I admit it. It's only two alarm, two-and-a-half, tops. I just wanted to be a big man in front of the kids. Todd: Daddy, are you going to jail? Ned: We'll see, son. We'll see. After the total disappointment of the Jalapeño Fire Doritos in the group test, I'm surprised and delighted to be able to report that these Inferno jobs actually live up to the billing rather well. 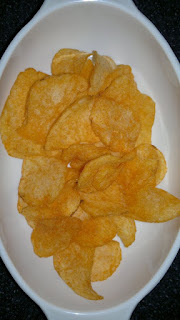 The heat builds up on the tongue and in the throat, especially if you eat plenty of them – and you will, as they are highly addictive – causing my nose to run and earning an Insert Crisps heat rating of 5. The closest so far to my favourite level of heat, which we'll call 6, defined as a typical Thai green curry as served in Thai restaurants in the UK. The only downside is that the crisps themselves are thin, weedy, continental-style things that are likely to have shattered into smaller pieces in the large and rather flimsy packet. So if you like a good old proper crunch to your crisp, you may be disappointed. But the flavour and the heat make them well worth it. These crisps are currently on sale as one of those special "this week" deals in Lidl, so their availability may be short-lived. I'm going into town now. I just have to, ah, do some shopping. Crisps may be involved.